Sambhogakaya (Skt. saṃbhogakāya; Tib. ལོངས་སྐུ་, longku; Wyl. 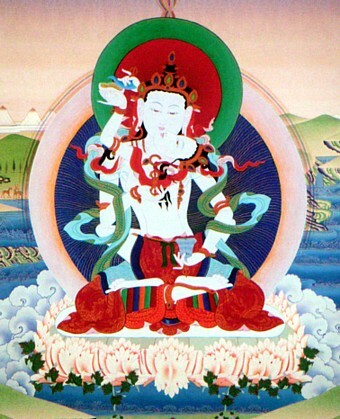 longs sku) is defined as a 'form body' (rupakaya) of a buddha, which appears only to bodhisattvas and is the basis for the arising of the nirmanakaya. It is adorned with the major signs and minor marks. Sambhogakaya is the dimension of complete enjoyment, the field of total plenitude, beyond dualistic limitations and beyond space and time. ↑ The Tibetan Book of Living and Dying revised and updated edition (HarperSanFrancisco and London: Rider, 2002), page 347. Thinley Norbu, The Small Golden Key (Shambhala Publications, 1999), ‘15. Saṃbhogakāya’. This page was last edited on 1 February 2011, at 10:18.